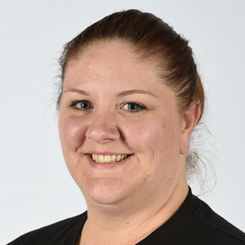 Gold Star Gymnastics » michelle r.
Michelle R. joined our front desk staff in the fall of 2015, after many years in customer service and retail management. She has her Nursing Assistant Certification and is certified in CPR and First Aid. But Michelle’s true identity is as a Disney super fan, even naming her dog Gus Gus after Cinderella’s sweet mouse friend.